Title: Get Out and Play! Toggenburg isn’t the only local snow spot that has been regarded as world class for winter family fun. Highland Forest, an Onondaga County park in Fabius that previously hosted a national snowshoeing championship event, is hailed as the Adirondacks of Central New York. It boasts more than 20 miles of trails for both snowshoeing and cross-country skiing enthusiasts. On the northern end of Onondaga County, near Baldwinsville, sits Beaver Lake Nature Center, also an Onondaga County park. It has seven miles of cross-country ski trails and four miles of snowshoeing trails. For hiking, there are more than nine miles of trails, many of which offer beautiful views of the 600-acre Beaver Lake. As for the downhill ski centers, each facility has something special that differentiates it from others. Labrador Mountain in Truxton, for example, is praised for its outstanding snowmaking capabilities. Greek Peak, in Cortland County, enjoys a reputation for steep, challenging terrain. Song Mountain, in Tully, is a special place for skiers and snowboarders who love jumps and rails. All three ski resorts, as well as Toggenburg, have earned high marks for the quality of their ski schools and lesson programs. East of Syracuse, there are two facilities in the Mohawk Valley: Woods Valley, near Rome, and Snow Ridge. Both sit just below the Tug Hill Plateau and get an abundance of natural snow. An hour north of there is Watertown’s Dry Hill Ski Area, which also offers tubing. And while the widely known ski centers, both for downhill and cross-country, are located in somewhat rural areas and on the outskirts of Central New York metro centers, there are two lesser-known ski and tubing facilities within the Syracuse suburbs. Four Seasons Golf and Ski Center in Fayetteville is a year-round recreation center that also has batting cages, soccer cages, a driving range and miniature golf. It opened in 1958 as a golf center, adding skiing in the decades that followed and tubing in 1996. An express chairlift was built in 2004, followed by a conveyor lift in 2006 that allows skiers, boarders and tubers to glide up the hill. The Camillus Ski Association, west of Syracuse, has existed since 1965. The all-volunteer organization offers season memberships and is also open to the public. A tubing park was added there two years ago. More than 800 people visited the tubing park in the 2014-2015 winter season. Last year, which was a very mild winter that limited the tubing center to a total of just three days, 250 people came. Eventually, said Camillus Ski Association president Andy Arbital, lights will be added. Like the Camillus Ski Association, the Cazenovia Ski Club is a nonprofit facility run by volunteers. According to its website, this hill just south of Chittenango Falls is “for real skiers.” Members boast of their hill’s steep incline, moguls and natural terrain. Although it’s a private facility, anyone can purchase a membership. The club was established in 1941. In the 1970s, skiing notable Viki Fleckenstein raced there before going on to compete in the Olympics and other international competitions. Winter fun in Central New York isn’t just about competition and recreation; it’s also about education. The Baltimore Woods Nature Center, in Marcellus, offers a variety of programs for families and children. In December, the center was scheduled to host a caroling-in-the-woods event, a nighttime star party and a solstice hike. 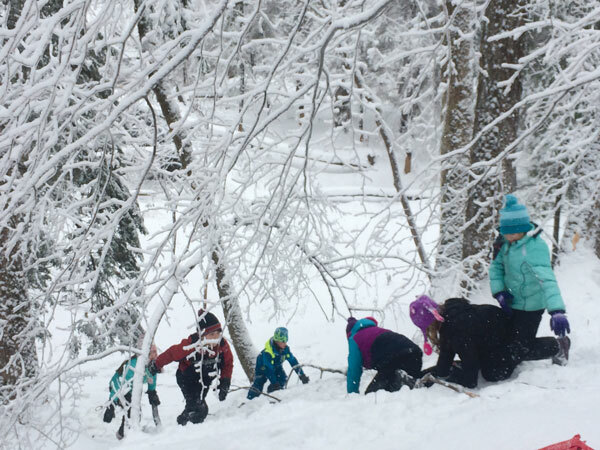 The center hosts a one-day outdoor winter program for school-aged children on Martin Luther King Jr. Day (Jan. 16), and a four-day camp during the February recess. For home-schooled children, there is a Tuesday morning “Lives of Winter Animals” series in January and February. While the camps and programs offer a variety of activities, a major part of Baltimore Woods’ mission has been to promote unstructured, free play in the outdoors, explained Stacy Drake, marketing director. 1 Song Mountain Road, Tully. 696-6711. 6935 Route 91, Truxton. 842-6204. 1135 Toggenburg Road, Fabius. (800) 720-8644. 2000 Route 392, Cortland. (888) 353-5707. 9100 Route 46, Westernville. 827-4206. 4173 West Road, Turin. 348-8456. 18160 Alpine Ridge Road, Watertown. (800) 379-8584. 403 Blackmore Road, Camillus. 487-2778. 8012 E. Genesee St., Fayetteville. 637-9023. 1254 Highland Park Road, Fabius. 683-5550. 8477 E. Mud Lake Road, Baldwinsville. 638-2519. 4007 Bishop Hill Road. Marcellus. 673-1350. 5251 Rathbun Road, Cazenovia. 655-8368. skicaz.com. Aaron Gifford is an award-winning writer who lives in Cazenovia with his wife and two children.